To successfully live and work internationally takes a certain flexibility, openness to risk, and an ability to read situations, even when you may not fully understand the language. Jeff Newman, CIA ’09, SHA ’10, has just the right mentality for international adventure. At fourteen, he knew he was destined for the food service industry and he gained experience in a variety of venues, then fell in love with Italian food. He worked as a prep cook at Alto in New York City while he honed his language skills, then found summer work as a waiter and cook at Casali di Bibbiano in Tuscany, Italy. Thus began his introduction to the topsy turvy world of different time zones, flight schedules, being the minority English speaker, and having to think on his feet to overcome the cultural differences of his host country. Most students pack work experiences and some travel into college, but Jeff seldom sat still during his time at Cornell. He expanded his skills as a sommelier intern with Del Posto, in New York City and then transitioned into front of house management at Molto Vegas in the Venetian Hotel in Las Vegas. It was there he started with the Batali and Bastianich Hospitality Group and felt he had found a company he might enjoy long term. Even as an incoming freshman he had planned to participate in the collaborative degree program at The Culinary Institute of America and he spent 9 months studying and learning in their world class kitchens. Despite all these experiences, he was still intent on returning to Italy so when he found out that Gruppo Ristoratori Italiani offered a scholarship for an intensive ten day experience to travel and learn about various regions in Italy and the foods they produced, he knew this was his opportunity. His scholarship award with GRI deepened his appreciation for the Italian culture and gave him unique exposure to many regional culinary techniques. 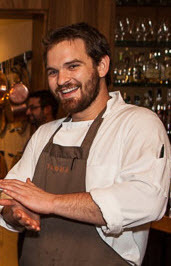 When Jeff first started exploring jobs for after graduation, his unique resume offered him many options but he fully intended to return to Italy, to study the cuisine and culture more in depth. Then Batali’s group offered him an opportunity too interesting to resist, the chance to travel to Asia to open restaurants as a manager. There he found one of the biggest differences in the Asian restaurant culture; tips are not part of a server’s wage but usually revert back to management. This practice changed the way employees were motivated and in turn dictated the service expectation of customers. During his time in Singapore and Hong Kong, Jeff gained an appreciation for how a truly branded company works, and what goes into executing the Brand Experience. Jeff worked with two different management companies in Asia, in Singapore they were managed by Marina Bay Sands, and in Hong Kong by Dining Concepts. His experiences with both gave him a wealth of experiences, from learning the different cultures of each company, to understanding different priorities in timing, and their individual perceptions of the brand requirements.